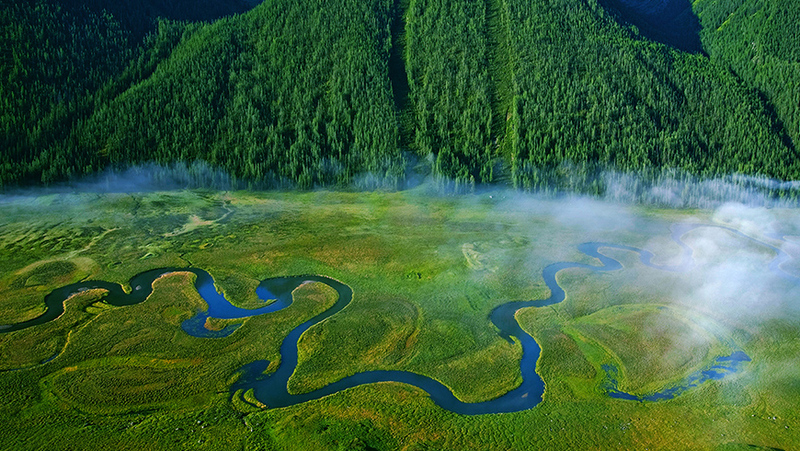 The Altai Project is harmonising development projects by strengthening the province’s legal and institutional capacity for enhanced protection of wetland ecosystems, through protected area planning and management. Photo: UNDP China. Xinjiang, China’s largest province, is a significant reservoir of biodiversity, with diverse landscapes and rich ecosystems. A vast region of deserts and mountains, Xinjiang sits at the crossroads of the ancient Silk Road trade route linking China and the Middle East, a legacy that can be seen as modernity and tradition merge. The Altai Mountains and wetlands are internationally recognised for their extraordinary landscapes, traditional cultures and livelihoods, and unique biodiversity. The Altai Mountains and their wetland landscapes include the mountains, forests, grasslands, and wetlands of the Urungu River, as well as the source of the Irtysh River and the lower reaches of both rivers. The two rivers originate in the Altai Mountains and flow through the northern part of the Zhungeer Basin, providing water to the northern part of Xinjiang, vital to both people and wildlife in the region. But as human activities increase, factors such as overgrazing, infrastructure construction, tourism development, and mining are threatening biodiversity. With funding from the Global Environment Facility (GEF) and UNDP support, the ‘Strengthening the Management Effectiveness of the Protected Area Landscape in Altai Mountains and Wetlands’ project is working to enhance the effectiveness of protected area (PA) management and address the threats to biodiversity and ecological services in the Altai Mountains and wetland landscapes in northern Xinjiang. The overarching goal is to establish effective management and safeguard globally significant biodiversity. Working with the Forestry Department of Xinjiang Uygur Autonomous Region, the Liangheyuan Nature Reserve Administration, and the Altaishan State-owned Forest Administration, the Altai Project is harmonising development projects by strengthening the province’s legal and institutional capacity for enhanced protection of wetland ecosystems, through PA planning and management. To date, there has been a significant reduction of threats to global biodiversity from incompatible development projects, an addition of 150,000 ha of terrestrial landscapes under formal protection, and improvements in PA management, institutional capacity, and financial sustainability. Terrestrial and wetland ecosystems are woven together via their numerous interlinkages, and therefore require a holistic, integrated catchment management approach to the administration of natural resources, which recognises land-wetland connections and inter-dependence. Appreciating this interconnectedness, the project cooperated with the Chagan Township Government of Qinghe County to train local minority women in traditional embroidery. Most of them are members of the Ahouz Embroidery Co-operative and the Slewu Embroidery Co-operative. By cultivating local women’s traditional embroidery skills, the project has helped participants expand markets, increase incomes, reduce dependency on livestock, and transform their livelihoods. The trainees created Kazakh-style yurt miniatures, penholders, swans, and other souvenirs. This project is part of the broader GEF Wetland Programme. The programme consists of a national co-ordinating project and six provincial projects located in Xinjiang, Hubei, Anhui, Jiangxi, Hainan, and the Daxing’anling region in Inner Mongolia and Heilongjiang. The common thread for all these projects is that they recognize the global value of wetlands. They are working to find sustainable solutions for people and planet. Wetlands purify our freshwater supply. They protect us from drought and store more carbon than any other ecosystem. They provide a critical habitat for migratory birds and a wide range of aquatic life. In addition to enhancing the protection of the unparalleled Altai Mountains and wetland landscapes, these efforts are also advancing China’s efforts to achieve the Sustainable Development Goals (SDGs). In particular, this project supported progress on achieving SDG 1 on poverty, SDG 8 on decent work and economic growth, SDG 11 on sustainable cities and communities, SDG 13 on climate action, SDG 15 on life on land, and SDG 17 partnerships for the goals, among others. This story was originally published on Exposure by UNDP Ecosystems and Biodiversity. Photos: UNDP China. For more information on the overall programme please visit: GEF Wetland Programme. For more information on the Altai project, please visit: GEF China Wetland Protection System Project - Altai.